Places to see in Hazaribag: Popularly known as a health resort, Hazaribag is dotted with a number of tourist attractions. The Hazaribagh Wildlife Sanctuary, nestled in the low hilly region is worth visiting. The site spans an area of over 184 sq. km. of plains, steep hills and nullahs, covered with lush green grass meadows and tropical forest. The sanctuary is refuge to a number of wild animals like Nilgai, wild bear, Chital, Sambhar, tigers and panthers. The sanctuary features several watchtowers to facilitate a close encounter with the wild. Another popular attraction is the Hazaribagh Lake, which is also a sought after picnic spot and a popular site for water sports. You can also pay a visit to the Canary Hill, lying adjacent to the town, which is admired with a nice park and three small lakes and a watchtower. You can enjoy the spectacular view of the town from the top of the hill. Nearby attractions around Hajaribagh: The breathtaking view of Parasnath (90 km. ), the highest hill in Bihar admiring the eastern margin of the Hajaribag plateau, is truly mesmerizing. 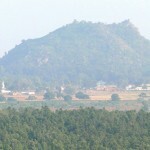 The hill located in the Giridih district is also home to the Parasnath Temple, frequented by the Jain pilgrims. You can also visit the temple of Rajrappa, renowned for housing the idol of Ma Chhina Mastika. The site is also famous as the confluence of rivers Damodar and Bhera. The Tilaiya Dam, located 52 km from Hajaribagh is another spot of tourist attraction, which was built by the Damodar Valley Corporation across the River Barakar, mainly for controlling floods. Tourists are really enthralled by viewing the extensive reservoir and the spectacular hillocks. You can also drive along the GT road to Hari Har Dham, located at Bagodhar, renowned for housing a Shiv Ling measuring 52 ft. Hundreds of tourists also visit Surajkund, 65 km from Hazaribagh, famous for hot water spring. Conducted tours are also organized by the Bihar State Tourism Development Corporation. Things to do in Hazaribagh: The Tourist Complex built few kilometers away from the Tilaiya Dam, is a perfect place for the sport enthusiasts, where they can enjoy several water sports and boating as well. The Hazaribagh Lake is also a popular place for water sports. You can also enjoy a nature walk, savoring the spectacular view of the town. How to reach Hazaribagh: There are a number of options to reach Hazaribagh. You can avail buses from Ranchi and Patna heading to Hazaribagh. Luxury coach services are also operated by Bihar State Tourism Development Corporation via Hazaribagh. Kodarma is the nearest railway station from the destination. If you want to avail flight, the nearest airport is Ranchi. Best time to visit Hazaribagh: The best time to visit Hazaribagh is between October and April. Lodging and dining facilities in Hazaribagh: You can spot a number of private hotels at Hazaribagh. Dining facilities are also offered by most of the hotels. If you are a street food lover, you can try out snacks like bada, aloo chop, samosas, tikki chat, matka kulfi or steaming maal pua.